Apple announced the Apple Watch Nike+ Series 4 on September 12, 2018 with units first shipping on October 5. With the Series 4's curved corners and reduced borders, the Nike+ Apple Watch 4 takes advantage of its 30 percent larger display compared to Series 3 models. Paired with the Nike Training Club app, Nike+ Watch Series 4 users can take advantage of over 180 free workouts featuring world-class Nike Master Trainers. The watches also include exclusive Nike watch faces with bold colors. 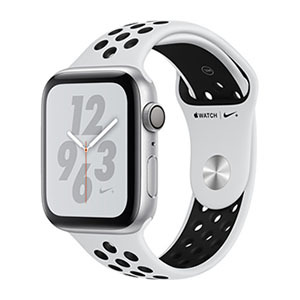 The Apple Watch Nike+ Series 4 is available with a Nike Sport Loop band that's woven with special reflective thread to stand out when light hits it, great for running outdoors as well. Available with GPS + Cellular or GPS only functionality, the Series 4 Nike+ line starts at $399.